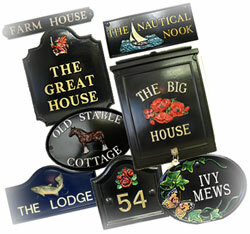 Contact Hayne-West - manufacturer of custom House signs & Post Boxes. Our customers often prefer to discuss their requirements before placing an order. To ensure that the best layout is achieved, our friendly, experienced members of staff are always pleased to discuss your specific requirements...however unusual they may be! We would be pleased to e-mail you a picture showing a rough layout of the wording and emblem on our sign or post box pattern before you place your order with us. If you don’t see what you're looking for on our website, please contact us as we may still have what you need. To obtain a quotation for a ‘special’ plaque, we will require a picture, sample or illustration, including details of size, shape, wording, emblem, logo, colours, and any other specific details. If you require a background colour that is not included in our standard range, we will need a RAL number (see explanation on the FAQ's page). There is normally an extra cost for non-standard colours. takes pride in its workmanship.